Jackson Hole meeting and Yellen and Draghi’s speeches could not support USD. moreover, Eurozone economy is getting stronger. 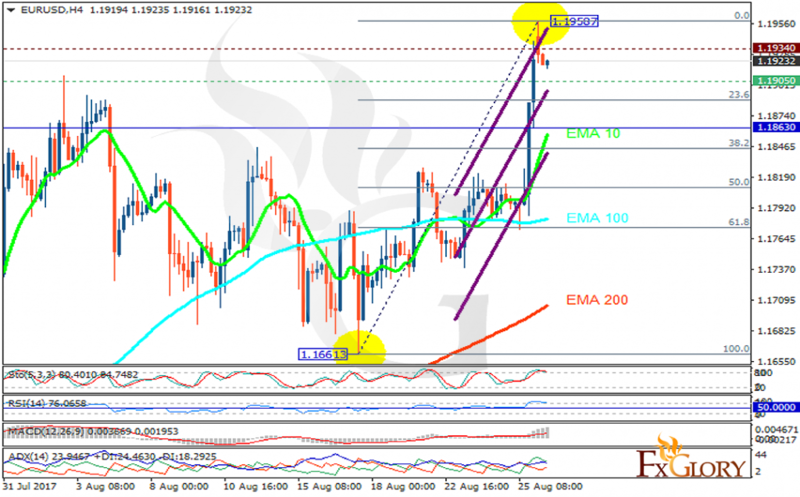 The support rests at 1.19050 with resistance at 1.19340 which both lines are above the weekly pivot point at 1.18630. The EMA of 10 is moving with bullish bias along the ascendant channel and it is above the EMA of 100 and the EMA of 200. The RSI is moving in overbought area, the Stochastic is moving in high ranges and the MACD indicator is in positive territory. The ADX is showing buy signals. The market seems to be risky today, however, the support level breakthrough will smooth the way for further decline towards 61.8 level of Fibonacci, otherwise, it will grow to 1.2 area.